To The North, where we do what we want! Since my month of blogging is largely about pushing myself as a writer and trying new things, I'm going to break from my tradition of reviewing the visual arts to the realm of literature; to the Yorkshire dales and David Peace, author of the absolutely brilliant Red Riding Quartet. David Peace has quietly and compellingly spent the last decade establishing himself as possibly the best contemporary British author. His books, all of which have so far been based on real events and people, are lyrical and often violent accounts of psychologically fascinating men involved in situations which they have little or no understanding of, and The Red Riding Quartet, encompassing the books 1974 (confusingly published in 1999), 1977 (2000), 1980 (2001) and 1983 (2002), for me is his greatest achievement to date. 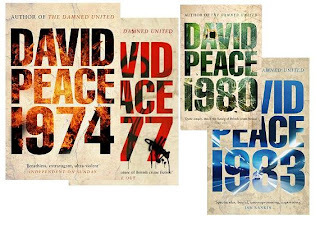 Each of Peace's books is set in the year of its title, with the slight exception of 1983 which, as the final book in the series, takes place over 20 years and sheds light on numerous events that occurred in the other books. Each book has a different central character at its heart; 1974 follows Eddie Dunford, a crime reporter who has returned to the North after working in the South; 1977 follows Jack Whitehead, who had previously worked with Eddie on the paper, and Bob Fraser, a copper who works for the Yorkshire police and has doubts about their methods; 1980 follows Peter Hunter, a Manchester detective who has been sent to investigate the actions of the Yorkshire police force; and 1983 follows BJ, a rent boy who appears fleetingly in the previous books, Big John, an ineffective lawyer, and Maurice Jobson, one of the senior Yorkshire policemen who formed part of the backdrop for the rest of the story. Each of the books centres around a crime; the first has at its heart the murders of several young girls, whilst the second, third and fourth are set against the killings of the Yorkshire Ripper. Peace then uses these crimes to examine the Yorkshire of his youth and themes of decay and corruption. The Red Riding Quartet may be set in the East Riding of Yorkshire, but in Peace's work Yorkshire is not a place, so much as a state of mind (to paraphrase Howard Moon). He paints Yorkshire as a land of violence, corruption and death; a paranoiac panorama of prostitutes with hearts of gold and knife wounds in their chests, of good men failing, and the institutions that make them fail. Nothing good happens in this world, at least not for long, and every town, every street, every road speaks of misfortune. The Moors serve as an uncaring canvas for Peace's nihilistic story to play upon. The bleakness of Peace's work could become overwhelming, it's fair to say that none of his books have happy endings. Or happy beginnings. The middles sometimes get a bit happy, but only until some gets their hand slammed in a car door. What prevents the stories from crushing the reader with their violence, physical and otherwise, and general tone is his language. David Peace does not write novels so much as long, free-verse poems. His use of alliteration, repetition and stream-of-consciousness sentence construction bespeak of a man who has studied poetry just as much as he has studied crime novels. Every chapter, every sentence, every word has its place and not a one is wasted. Each sentence has a cadence and a rhythm to them that makes reading truly horrific things immensely easy and, whilst perhaps not enjoyable, at least palatable. You are so swept away by his words that you don't have time to process what is happening. His work relies little on description since his prose is so vibrant and alive that you very quickly find yourself living in the heads of his characters and you fill in the blanks from there. It also helps that the books share several key locations, so once you have been introduced to the Millgarth Police Station in 1974, Peace needn't spend much time reacquainting you with in in 1977. His Yorkshire builds over the course of the novels, giving you a chance to live and breath in it over prolonged periods of time but also giving Peace license to only drip feed you descriptions and information, knowing that you may understand at a later date. Much is often made of Peace's use of repetition in his work; he will take phrases and sprinkle them throughout the book, occasionally repeating them dozens of times in a novel, and even more times in subsequent stories. This technique has two distinct advantages; firstly, it allows him to create an consistent character in each book. The repetition of mantras, of stories, of words is something that everyone does in everyday life, and his fragmentary style allows him to create real, believable characters. The second advantage is that with each repetition the phrase gains new meaning. Much like the work of William S. Burroughs, who used repeated phrases in different situations to strengthen the power of the words, Peace's reiteration constructs new meaning upon new meaning, so by the end of the story a seemingly innocuous phrase could have a sinister association. The journey of that phrase, like the journeys of his characters, is often perilous and dark, but it makes for a exhilarating ride. Even though I have waffled on for so long I really don't think that I have even scratched the surface of Peace's work. He is a brilliant novelist whose work has completely obliterated what it means to write crime fiction and I think that everyone should read this blistering collection of books. It is a stunning achievement.